After over 20 years as a band, Marduk has earned their respect and moved beyond misconceptions and controversy. The band has played countless shows on countless tours. On their most recent North American jaunt, SPB caught up with them. Speaking with guitarist (and only original member) Morgan, we talked about many issues regarding touring and working on their new album Serpent Sermon. 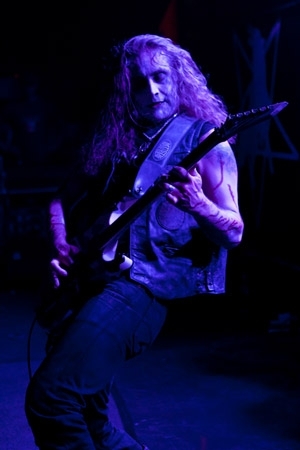 Sitting on the back of the Marduk tour bus, he broke down some of his influences and some of the ideas that drive him and the writing of the new record. Scene Point Blank: How is the current tour going? Morgan: So far, so good. We just have the album coming out. We actually started out before the album came out. We started with 9 dates in Russia and did 3 shows in Siberia. Then we went home for a few days and went out to Puerto Rico. Then we did the States: the east coast up to Canada, and went and did a few shows in the States and back up to Canada. 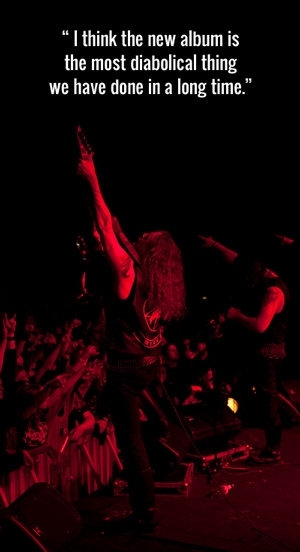 Now we continue, do a few more shows in the States, and finish up in Mexico. So, so far so good. And we have a lot more coming up. We'll be doing the summer festivals in Europe as well as a 45 day headlining tour in Europe. So the march is on. Scene Point Blank: We had noticed there were a few newer bands on the tour. Were some of these chosen by the band or was this more of something set up by your label? Morgan: We left it up to the booking agent to do all the bookings. 1349 we had toured with before, Withered we had also toured with before. 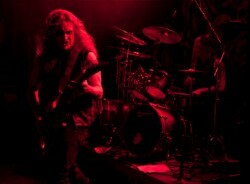 Weapon, I wasn't familiar with before but they are a great band so it's a pleasure to be on the road with them. It really is a good combination of bands. in the past that may have been a bit more vague. Are there any details which could help the listener grasp the overarching concept of this record? Morgan: It is a concept record and the title, I think, is very much reflecting the whole spirit of the recording of the diabolical content. I mean, Serpent Sermon, everyone knows who we refer to as the serpent and everyone knows what a sermon is. So I think it is a very straight-forward album when it comes to the concept. That’s really all there is to say about it. I think it is the most diabolical thing we have done in a long time. It is shining through more when, in the past, it was more clouded. It is more straight-forward and in your face. So it'll be different to read the lyrics and see what comes to mind. that those songs were kept separate from the current record? Morgan: Not really—because of the road. For the Wormwood album we had done, like, 230 shows for the album. When we got home we were rehearsing for the new record. So the songs themselves may not be that different from the songs on Serpent Sermon, but the concept, we didn't want to mix it up. We decided to do those three songs as limited EP while we were still marching across the world. We had been mixing things up before, but this time decided we didn't want to mix the concepts that much. So, why not do an EP? I like the format it's something different. Scene Point Blank: The was a single released for the song "Souls for Belial." One thing that had caught me off guard was the choice to do a cover of a Woven Hand song. A) it is not a very "metal" song, and B) Woven Hand as band are known for generally Christian themes. Was that something you found to be a dichotomy between what you guys do and that band? Was that the reason you chose the song, or was there a more specific reason? Morgan: It was really all of those reasons. First of all, it is great to do a cover of a band that is so different when it comes to their view and mine, and then do your own version of it. When it comes to doing a cover, I mean everyone has done Bathory, Destruction, Venom. It isn't boring, but everyone can do their version of it. I mean do we really need another Bathory cover that sounds more or less the same? It's more interesting to me, as an artist, to take something that is completely different music-wise, and completely different concept-wise, and do your own take on it. So for me, that was very interesting to do. Morgan: Yeah, we have Celtic Frost in the past. We have done Bathory and Destruction. We've done Piledriver. But, I mean, it feels like we have done all those covers and, if you're going to do a cover, why not do something completely different and do your own turn of it? It's more interesting for everybody. And still I consider Woven Hand completely opposite to what we do to still have a lot of darkness in them musically. We just did it differently. Scene Point Blank: So one could assume you're a Woven Hand fan then? Morgan: I remember seeing them in 2004 and it's still one of the best shows I've ever seen. I didn't know what to expect. I went in Stockholm, Sweden. There was just a small drum kit and a small guitar amp. I wondered "how is this going to sound?" I found myself amazed by the power he could bring forth just by himself, his voice and the drummer. And I've seen them many times since then. Hopefully the cover introduces something to some people that they might enjoy. Scene Point Blank: Are there any newer bands, that are maybe lesser-known, that have managed to stick out to you either through this tour or maybe just in general? with the internet and everything, but I would say you get such a massive amount of things that you don't really see it. Like you don't see the forest for all the trees. There’s just so much of it. I still listen to what I have been listening to always and if I discover something new—but I haven't really discovered anything brand new that has stuck with me, so I don’t know. Scene Point Blank: Recently you guys have celebrated your 22nd year as a band, which is somewhat of an anomaly in metal. You guys have persevered through member changes, most notably Mortuus [their current vocalist] joining over the past four albums. You have seemed to lock into a particular sound, managing to contain doomy passages but still very much a consistent black metal sound. Morgan: Well, I think we had some doom parts in the past but, there are a lot of albums to account for. It was a big thing when we changed vocalists. It's such a big change. I mean, if you change bass players you don’t really hear it in the same way as you do when you change vocalists. When I knew we were about to change vocalists, I didn’t really want to go for somebody that had the same voice as the one prior. I wanted somebody that was completely different. I knew who I wanted so I got in contact with him, as we had known each other before. He has a unique voice, a very different voice when it comes to black metal. It’s used more like an instrument rather than just singing, which helps with arrangements. We just seem to work in a different way and it was inspiring for me as a musician. Scene Point Blank: Your last three albums seem to have a kinship amongst them. Was there a plan to keep that thematic consistency? Morgan: Not really at all. We never sit down before recording an album to reflect on what we have done in the past or what we should do or how we should sound. For me, as a musician, it should come naturally. We find our inspiration and just see where it takes us. We never sat down and said, "We have to write heavy, or we have to write fast." We just work at it and work hard to make the music and lyrics become one and that is reflected in becoming a more powerful unit. When you hear the music it should reflect the lyrics and vice-versa. It should paint a strong picture in your mind and give you a sense of the lyrics. Scene Point Blank: With the age of the band do you feel a certain responsibility towards younger bands, particularly in the black metal community? Morgan: No, we do what we do. That's what we've always done. We've never cared what other bands were doing or how they look upon us. We've gone where our inspiration has taken us, where our dedication and our will has taken us. That's what I think about, rather than what anyone else is doing. For me it is about unleashing energy. Scene Point Blank: As a band that tours a lot, is there something specific about playing some of the places that many other bands don’t play? do a full South American tour. We have played Guatemala, Honduras, Costa Rica, really wherever down there. For me, it's great to see the enthusiasm and the power of the people and to see how hungry they are for the music. "Why do you play other places?" It isn’t the same thing, it is a different power. It's always great to reach other places with your creativity and we get to reach those other places. We work very hard to get to go there. Like Siberia, it was great to go there. It's a symbol of our will to get to march across the world and not just play it safe like a lot of bands, going to the easy places. We don’t care as long as we can do it. Photos copyright by Ingela Hansson. Words by Jon E. on Oct. 20, 2012, 9:12 p.m.
Posted by Jon E. on Oct. 20, 2012, 9:12 p.m.
Posted Jan. 12, 2015, 8:49 p.m.
Posted Nov. 16, 2014, 11:01 a.m.
Posted June 21, 2014, 4:12 p.m.